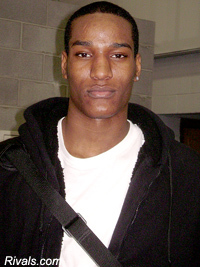 Juvonte Reddic is the latest commit in the Class of 2010. He's a true steal for Shaka Smart and staff. With offers on the table from Maryland, Oklahoma, and Mississippi, and visits to the latter 2 on tap, Reddic cancelled both visits and made his pledge to the Rams last weekend in Richmond. Juvonte plays on a stacked Quality Education team that boasts the #2 2011 prospect in the nation in Quincy Miller (who is being heavily pursued by Kentucky), as well as point guard Stargell Love (headed to Baylor). Reddic, a late blooming big man, is athletic and has a motor. He was one of the top available post players in the country. Reddic cited the overall structure of the program as a selling point. His game will remind many of current Ram Larry Sanders with his ability to run the floor, block shots, and rebound. He has a couple of highlight videos online and subsquent lengthy threads on major college conference message boards across the nation such as Georgetown and Maryland. His athleticism and motor has people buzzing and he was a very popular name in recruiting circles for teams looking for a big man with upside and athleticism. With Juvonte's athleticism and quickness, SLAM magazine suggested that Reddic may be the next in the growing line of NBA prospects to come out of VCU after Eric Maynor and Larry Sanders. While he's nowhere close to either player at this point, his raw potential certainly puts him in a similar place as Larry was when he first came to VCU. Juvonte has more of a high major body than Larry did coming in, as Reddic is a solid 215 (while Larry was 200 soaking wet). His wingspan is not as large as Larry's but he is more explosive athletically. Here is an interview with Juvonte and Quincy Miller (#2 2011 prospect) to gauge his height as it is listed anywhere from 6'8 to 6'10. Here he is less than half an inch shorter than Miller, who is well-publicized as 6'10. One of the faster rising forwards in the 2010 class is Juvonte Reddic. The Quality Education Academy (N.C.) power forward opened eyes in a big way with his tremendous senior season, and attracting high-major attention. Over the weekend Reddic made an official visit and subsequently his commitment. At 6-foot-9 and 210 pounds, Reddic has the look of a high-major basketball player. He also has the game of one. Reddic is capable of hitting shots from the mid-range, has athleticism around the rim, and he knows how to rebound. With that skill set schools like Maryland, Ole Miss, Oklahoma, and Virginia Commonwealth came calling and offered him a scholarship. While all four did a great job, according to Quality Education Coach Isaac Pitts, the Rams were especially impressive and gained Reddic’s commitment. One reason why Reddic was still available is because of the fact that he burst onto the scene late. A classic late bloomer, Reddic had a great senior season, and now is scratching the surface of his potential. On the strength of his senior year, Reddic will earn definite consideration for a Rivals150 ranking when they are updated after the season. Juvonte is a heck of a player to end recruiting for the 2010 season with. "VCU's outstanding recruiting class got a lot deeper over the weekend. North Carolina native Juvonte Reddic popped for Shaka Smart's team this weekend." says Dave Telep, national director of scouting for Scout.com. "The Rams have an excellent class coming next fall. Rob Brandenburg just helped beat the nation’s No. 1 in the Ohio regional finals. Bigs D.J. Haley and Toby Veal join wing Reco McCarter and now Reddic." The future looks very bright for VCU basketball and Shaka Smart has left no doubt in anyone's mind that if there is one thing he definitely does well, it is recruiting. The fact that he is a first-year coach makes this haul all the more impressive. With this new influx of fresh, new, and exciting talent, and the experience and skill of a talented senior class led by Joey Rodriguez, 2010-2011 will be a very exciting season that will hopefully result in improvement of an already successful 25-win campaign so far this season.